Pulsation dampers (aka pulsation dampeners) are normally applied immediately downstream of reciprocating positive displacement pumps. No matter whether you have simplex metering pumps or large multi-headed machines, reciprocating positive displacement pumps produce pulsating flows which lead to pressure spikes. These pressure spikes may not be desirable in a given piping system, therefore there is a need for a pulsation dampener. Why does a pump produce a pulsating flow? Considering a single-headed, reciprocating pump, the piston moves toward the pump head on the discharge stroke, pressure within the cylinder rises and product is forced through a check valve and down the discharge line. In order to accelerate the fluid to maximum velocity, each piston stroke must overcome the inertia of the columns of fluid in the suction and discharge pipe work. At the end of each stroke, this inertia must again be overcome to bring the fluid columns to rest. This cycle of alternate acceleration and deceleration is the primary cause of fluid pulsations or pressure spikes. 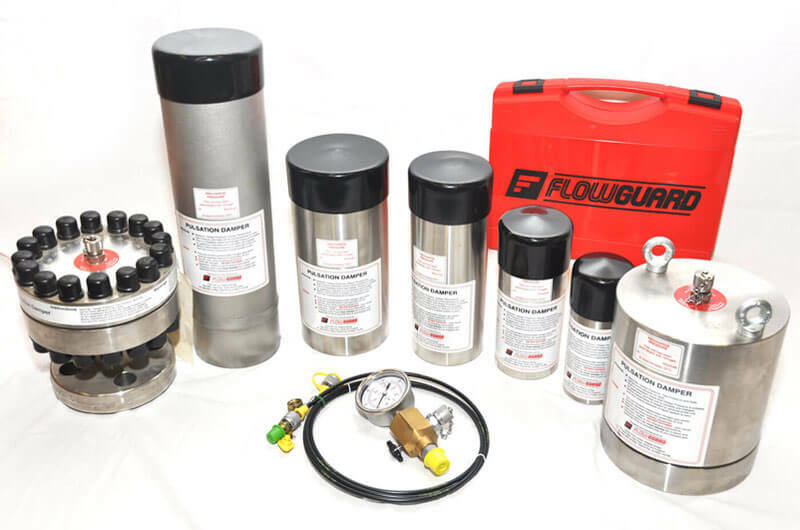 Flowguard Pulsation Dampers are gas-filled vessels installed on the pipeline. They store up and discharge part of the pump stroke volume by alternately compressing and expanding the gas cushion in synchronization with the motion of the pump. In actuality, these vessels work much like a filter in a power supply as it converts the ripple of a rectified sine wave into dc current. The gas cushion is normally nitrogen gas and is separated from the process fluid by a flexible membrane (i.e. bladder, diaphragm or bellows). The flexible membrane prevents the nitrogen gas from being absorbed into the process fluid which means very little maintenance (if any) is required during standard operating conditions.